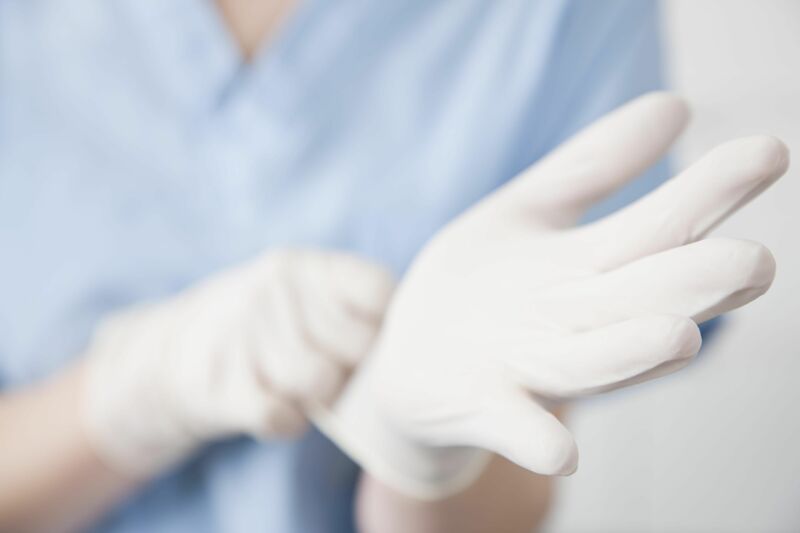 Home › News › Surgical Gloves: Can they be Re-used? Back in the 1980’s, hospitals around the world used to routinely wash, powder, pack and re-sterilize surgical gloves. Reusable surgical gloves were generally made thicker in order to withstand the strain of reprocessing. However, the more the gloves were re-processed, the less effective they were in preventing cross-contamination, and the less comfortable they became in comparison with recently manufactured gloves. Research has shown that there is a direct relationship between the breakdown of the latex glove barrier and the number of times worn. Although the deterioration of the gloves is not always visible to the human eye, it inevitably occurs with each use. It is risky to rely on the subjective judgment of hospital workers to decide when a surgical glove is no longer a reliable instrument. One of the main problems is that the defective glove may not be obvious to the user. Past surveys have concluded that only 50% of surgical glove punctures are noticed by the wearer. Therefore, it is obvious that the risk of infection to both health worker and patient increases based on how long the surgical glove is worn, especially if the glove is being re-used. Modern surgical gloves are designed for conditions that are based on the most recent science. They are made out of durable material but are also very thin to ensure that surgeons have full function and sensitivity of their hands. They are also made to be as comfortable as possible to avoid any discomfort during long surgical procedures. These surgical gloves were never intended for over extended use or re-sterilization, and re-used surgical gloves should never be relied on to provide and maintain a strong and sterile barrier for safety. If you are looking for a reliable source for surgical gloves, StaySafe Medical Clothing manufactures affordable oxygen masks of the finest quality. Our latex, latex orthopedic, nitrile, and polyisoprene gloves are manufactured with CE, ISO, and USFDA certifications. Made with premium material, StaySafe surgical gloves are designed for both consumer, hospital, and clinic use. StaySafe aims to provide high quality medical clothing to meet the demands of the developing world. Our superior standards and competitive pricing set us apart from other manufacturers. Looking for an oxygen mask manufacturer? Inquire with us today if you are interested in distributing our medical clothing products.